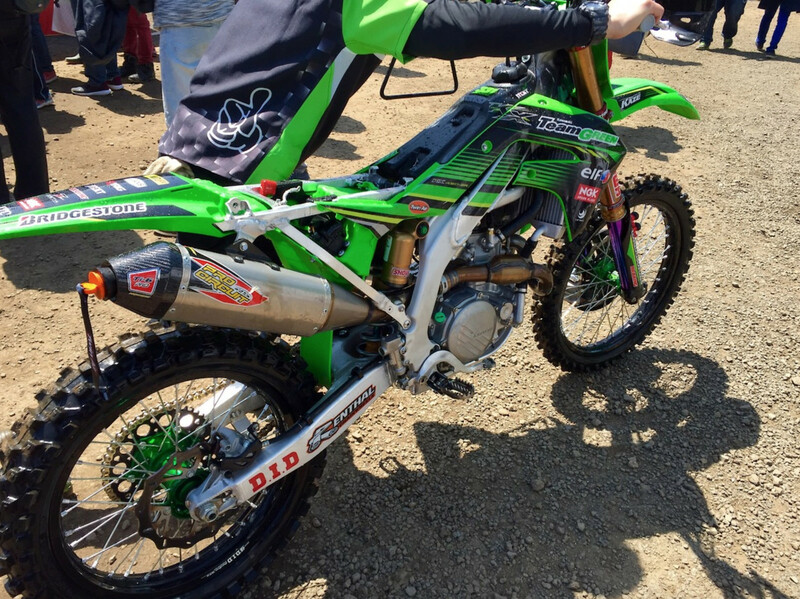 Well look what we have here...an all-new KX450F straight from the Land of the Rising Sun. 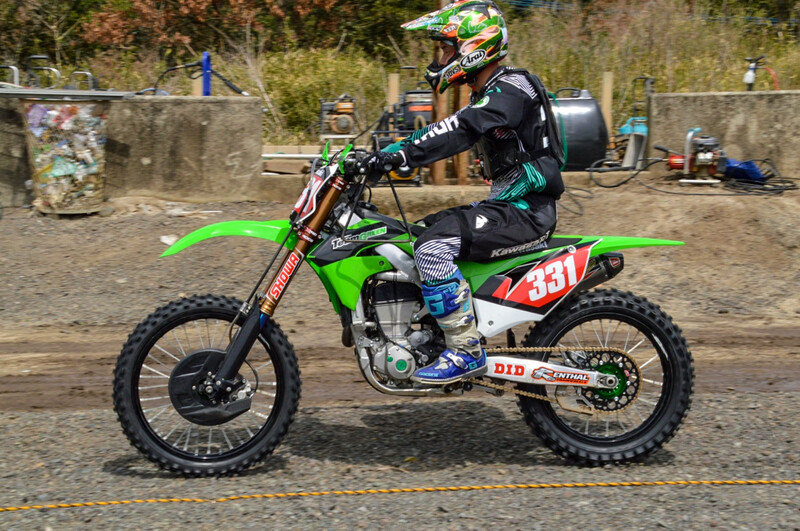 Second Update: Forum member Tempura, who's located in Japan, posted up a couple photos of the KX450F heading from the wash area. This gives us a bit of a view for the new airbox angle, subframe and electronics area of the bike. 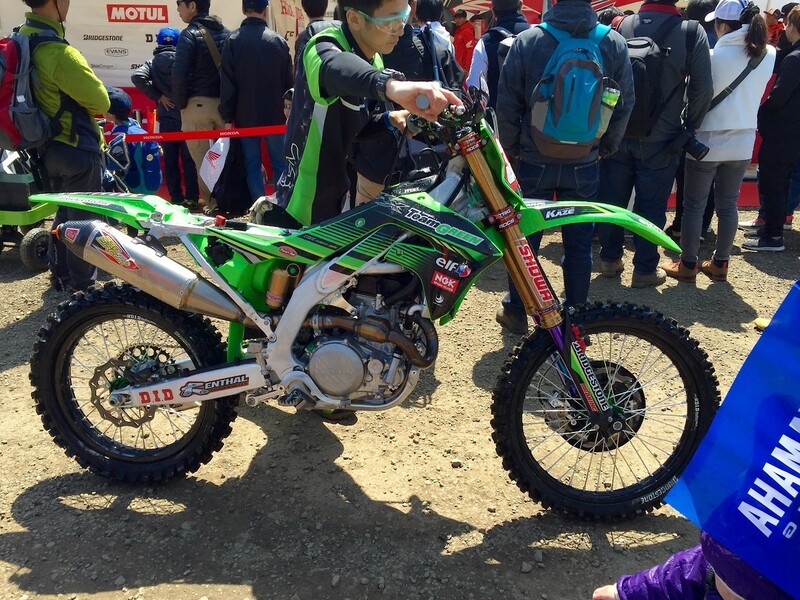 Update: Per usual, Donn Maeda from TWMX took the trip to the Land of the Rising Sun for the opening All-Japan National round, getting another look of this new KX450F. Below is a more complete/updated look at the machine and if you want to see more, ehad over to Transworld for a little extra drool factor. Most of what we saw from a few weeks ago seems to have carried over, although the complete graphics scheme really has tied the new plastics together nicely. The headpipe also seems to be finished out of production material, instead of what looked like an automotive pipe from the prior version we spotted. Lastly, we've got a better look at the front axle, which we believe is beefed up in diameter. Scroll farther down for all our original observations from when this bike was spotted a few weeks back. 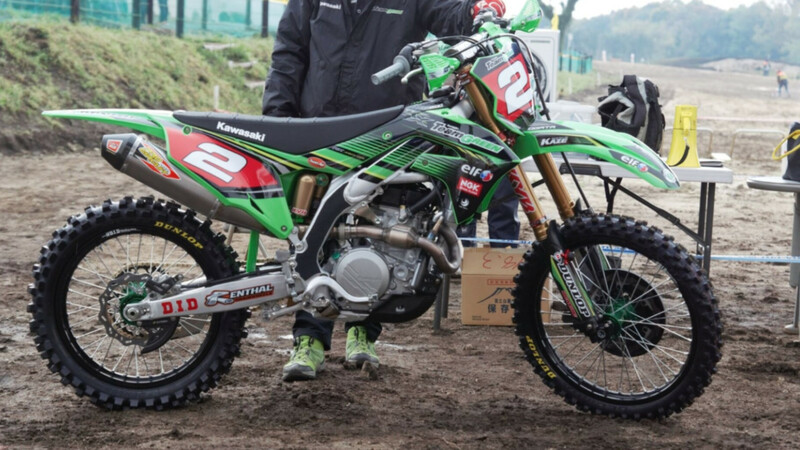 Usually we don't see new bikes until the first round of the All-Japan National Motocross championship, which is still a few weeks away in Kumamoto...but this year, Kawasaki has pulled out their all-new KX450F a few weeks early for a pre-season regional race. We've been floating around some info about the KX450F for nearly a year now, knowing it's coming with electric start standard, including a new engine to match this...along with a full bodywork and chassis change to go with it. What's not obvious because of each factory KHI rider using different suspension components (very common in the Japan Motocross series for factory teams) is that the bike should be coming equipped with Showa spring forks for the 2019 model year. Below you'll see a twitter embed from the original photographer, who was forwarded to us from a friend in Japan. Go follow this guy on Twitter or Instagram, specifically Twitter as he has more photos from the regional race...including some frame changes for HRC Honda and some things that Yamaha is working on as well. Scroll down farther for some take away shots and observations on the new machine. From just the quickest peek, it's obvious to see there's a lot going on with this new machine. Most obvious is the new body work and chassis but things get more interesting from there. As a reminder, these are pre-production factory race bikes...so things like aftermarket exhausts and triple clamps, billet hubs, and works suspension aren't items you'd see on the final production bike. We use these bikes for sneak peeks of the engine, chassis, bodywork, and feature changes. From this side the new shrouds and sideplates are noticeable, with the sideplate being a part of the airbox cover now. From there we can see a new swingarm and rear chain guide, while the newer frame spars are hard to see due to the boot...but looking down we can see a new cradle design and shape holding the engine from below. As for the engine, this side looks radically different as the ignition cover is new and the obvious addition of the electric starter motor behind the cylinder. The cylinder itself looks quite compact, as the the chain tensioner has been moved up to the cylinder head to make room for the start motor and routing. The head itself looks a little bulbous due to the small cylinder area, similar to older KTM 250 SX-F engines, this is due to the chain tensioner area and the fact the engine is still dual overhead cam. From here we can also see a hydraulic clutch slave cylinder right ahead of the front sprocket guard. This unit looks quite production but we're not quite sure if this will make it when the bike is delivered to the public. This side view gives us a much better look at the new frame spars, which have much sharper and immediate direction changes. The shock body is also quite different, using a piggyback reservoir that looks similar to the ole KX125 or the '04/05 KX250F. Also look at how flat the seat profile is going from the seat onto the tank and how far forward the gas cap is. Engine wise, the cases don't look as different due to a similar clutch cover and oil filter/water pump location...but you'll see the kickstarter are has been removed and the oil fill plug added near that location. Beyond that, the backside of the cylinder head shows off the intake tract...which looks to be at a little bit of a steeper angle than usual. It'll be interesting to see if Kawasaki is able to work their engine the direction of Yamaha or Honda's straighter intakes without a wild shock configuration. As for the headpipe, we'd expect a much cleaner version (probably with a guard over the resonance chamber) come production. Each factory bike uses a different suspension manufacturer, which is common in the Japan National series so each OEM can track the development of each provider. In the case of the KX450F, we've heard their contract with Showa continues into 2019 models so we expect to see the brand's latest spring fork aboard this new KX. Beyond that, we're happy to see a traditional shock design over the BFRC...we're hoping and we've got a feeling it'll stay that way for production. Also from here we can see the right-side intake is gone, with a full coverage sideplate. The past few years the right side intake hole has been blocked off for sound reasons anyhow, so it's nice to see the bodywork take care of that instead. While we expect the subframe to be new, the fact there's already a Pro Circuit exhaust can and mid-pipe attached to a pre-production KHI header makes us believe the exhaust mounting location hasn't changed much at all. Also the X-Trig triple clamps makes us believe that current triple clamps will carry over, as we doubt X-Trig would have a one-off ready so early. With the first round of the All-Japan National just weeks away, we expect to see more and more of these new bikes, so stay tuned for more! Do you think the BFRC shock could make it's way to the Kawi too? Any pics of the yellow ones? E-start or bng? No yellow ones, Suzuki pulled their All-Japan National team. The Japanese Nationals have the coolest helmets of any series worldwide. Question is how much shorter it will be ? The kawi always felt so long and " tanky"
Not a fan of head pipe .. looks like the 09 head pipe and any one that owned one knows what I’m saying. That’s why they changed it in 10 ..any tip over pretty much had to replace it . Shrouds look similarly shaped to the late 2000’s version without the holes. Damn, I will miss the half circles molded into the valve cover gasket! The times, they are a changin’. Man, for sure. This new head shape comes off all alien like. Just for the estetics this looks worse. The Circels looks tricker. But yeah time changes things change - I think KTM 250F had similar look even back in 05-06 ??? Any info on what frame changes for Honda and what Yamaha is working on? We’ll see the 2019 YZ250F break cover very soon. It’ll be a better handling version of the 450, with 42 horses instead of an ungodly 57 hahaha...so I’ve heard.